VITEEE Registration 2019: Vellore Institute of Technology will conduct Vellore Institute of Technology Engineering Entrance Exam (VITEEE) for the admission to the first year in BTech/ BE/ BArch course. All interested candidates who meet eligibility criteria in all aspects will be invited to register themselves till the last date. Latest Update: Date of issue of VITEEE 2019 Online/Offline Application forms Announced Check the Table Below. Scroll down to check. Latest Update: VITEEE Syllabus 2019 and Sample Questions Uploaded on website check Here: Syllabus || Papers. To take the VIT entrance exam for engineering course, aspirants must submit the VITEEE Admission Form after filling it through either online or offline process. Here we have provided the complete information in this article related to exam, application form, fee etc. Candidates can check here tentative VITEEE Exam Schedule. Aspirants, who want to take admission in engineering courses in VIT campus, must check the VITEEE Exam Eligibility before applying for the application form. PIO/ OCI candidates who have studied in schools in India in the last two years can apply for VITEEE. Candidates who are resident or non- resident of India are eligible for VITEEE 2019. Candidates who have completed or will appear in the class 12th exam in the year 2019 can apply for the VIT application form. Must obtain an aggregate of minimum 60% in Physics, Chemistry, Mathematics/ Biology in class 12th. Applicants must be born on or after 1st July 1997 to apply for the exam. To apply for BArch course, must qualify the NATA 2019. Mode of Payment Payment Gateway via Net Banking/ Debit card/ Credit card or Demand Draft. The application form can be filled through both online and offline process. Candidates can fill the form as per their choice. Applicants are advised to check the application before submitting it. Once the form will be submitted, it cannot be modify. To fill the OMR application form, must use blue or black ball-point pen. Form must be filled in capital letters and in English language. Visit the official website from where you can get the link for VITEEE Registration Form. Click on the link to register and then enter the basic details like name, date of birth, mail id, and mobile no. Also set a password. Login to your account with generated user name and password. Proceed to the application form and fill the all empty required field. Select VIT campus as per your choice and VITEEE test city as per your convenience. Submit the VITEEE Application Form and then note down the application no for future reference that will be generated after the form submission. Pay the application fee through the payment gateway method via credit card/ debit card or net banking. After payment, upload the scanned photograph & signature as per specified format. Take the print-out of filled application form for further use. Candidates can get Application form of VITEEE from different post offices by paying the application form amount i.e. Rs. 1200/- in cash. Read the instructions carefully before filling the OMR VITEEE 2019 Application Form. Fill the form with all correct information as mentioned in class 10th mark sheets. Affix the recent, color and passport-sized photograph at the place given on the form. Put the signature on the form at the proper place. After filling the form, must send it by speed post or registered post at the given address and must ensure that it should be reached at the address on or before the End week of February 2019. VIT, Vellore – 632014, Tamil Nadu, India”. 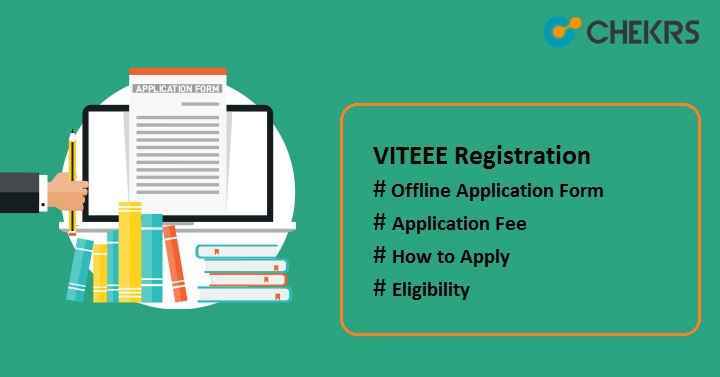 Get all the latest updates related to VITEEE 2019 Exam, VITEEE Application Form, etc. Keep visiting this site regularly. Best wishes to you for your bright future.